Good news for all Mac users out there. Download the new Mac OS Sierra for free. The main draw is the integration of the assistant Siri into the OS. This new feature will certainly delight iPhone and iPad users. 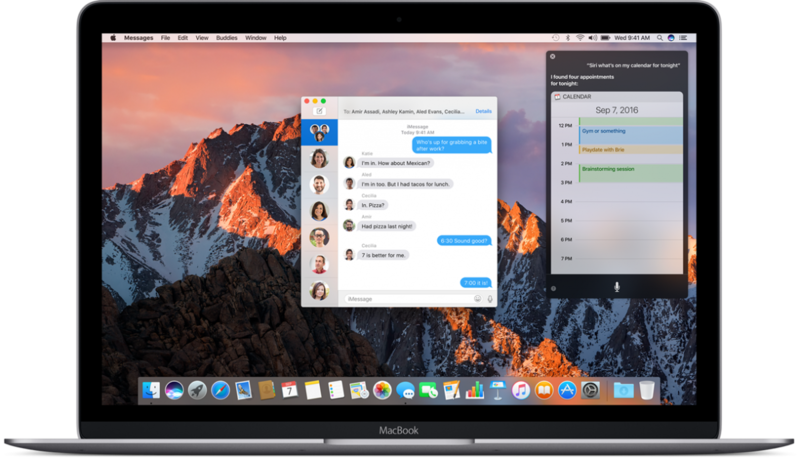 Apple today announced its new OS named Mac OS Sierra, which replaces OS X. Here’s a quick review of the new main features. Siri is familiar to a large user base. The desktop version contains some unique features specifically designed for the Mac. What can Siri do for you? Well, you can order it to search documents using a natural language, send emails, search information on your behalf and configure settings. The search results that Siri finds are visible on the Notifications pane, which is really useful since they, therefore, are easily accessible after you leave the search. Mac OS Sierra maximises your available storage by actively removing duplicate files and documents. Rarely used files are automatically uploaded to the iCloud thereby freeing up space on your local drive. Apple continually tries to create an eco-system of devices. For example, Apple Watch owners can unlock Macs just by being physically near the Mac. Hence, there’s no need to remember passwords or using the fingerprint scanner anymore. Another really cool and productive integration is the truly universal clipboard across Apple devices. Copy and paste anything and it’s instantly accessible on any Apple device that you or your family members own. Similarly, documents on the Mac’s desktop are synced with the iCloud, so that they are accessible on other devices and by family members. Sierra enhances the online shopping experience. Shoppers can now easily click the Apple Pay button at checkout on stores that support this payment method. The payment is confirmed using touch id on iPhone 7 and iPhone 6 or with Apple Watch. This exciting payment option is soon available in New Zealand. Sierra uses more memory and processor time than previous operating systems. Hence, it might run a bit slow on older Macs. However, it should run fine though on Macs purchases in 2010 or later. The MacBook Pro and the Mac Mini should be safe from mid-2010. Download Sierra for free from the Mac App Store. The download file is 5 GB, so it might take a while before the download completes. Don’t forget to make a back-up before commencing the installation process.